Tomatoes are plentiful at this time and if you grown them yourself it’s good to have recipes to use them. 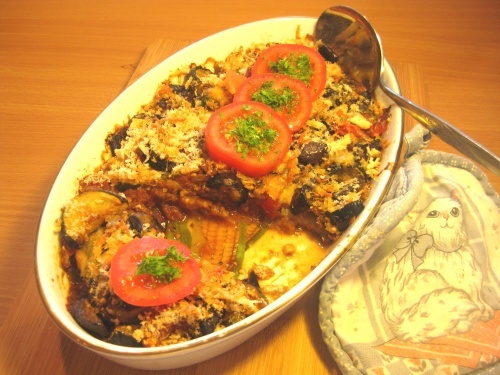 Aubergines go well with them in this dish which can be an accompaniment particularly to lamb or sausages, or to have as a lunch dish on its own. You will need a shallow ovenproof dish 1½ pints / ¾ litre capacity. Serves 4. Prepare the aubergine. Cut it into small pieces put into a colander with two teaspoons salt, place a plate on top to weigh it down and leave for one hour. Drain and dry on kitchen paper. Meanwhile skin 5 of the tomatoes and chop them, reserving one for garnish. Chop the onion and slice the courgettes. Heat the oil in a large frying pan, add the aubergine and fry until golden, add the onion and continue frying over gentle heat to soften it a little. Add the tomatoes and courgettes with the crushed garlic, cinnamon and sugar. Season with salt and pepper. Simmer all together for about 5 minutes, stirring occasionally. Add the parsley. Heat the oven to Gas 5 / 190C / 375F. Butter the baking dish and tip the mixture into it. Sprinkle with a mixture of breadcrumbs and cheese. Dot the surface with butter and bake for approx 30mins or until brown on top. Garnish with slices of the reserved tomato.